But I stayed for the winter granita and the homemade peppermint patties and then this arugula/pecan/mozzarella salad with BACON just sort of sealed the deal. I suggest you waste a little time on Butterflyfood. *Hey, I can look at them, even if I can't eat them. 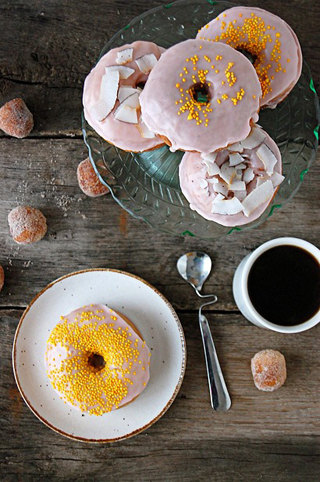 **Do Canadian bloggers have a monopoly on the gorg donut photos or what?? Also: Do we like "donut" or "doughnut"? I can never decide. i once heard "they are DOUGHnuts because they are made of DOUGH- not DOO." Doughnut for me. Donut just looks strange, but I will admit to feeling a little pretentious whenever I wright doughnut. I go with doughnut. Although I sometimes switch back and forth, depending on the company. I may need to make that salad, immediately. Thank you. Doughnut. Is it a Canadian/American thing? I don't really care how they are spelled as long as I am eating them. This breakfast looks so delicious to me right now that I think I might buy sprinkled sugar donuts for tomorrow morning. I'm 38 weeks pregnant. What do I care at this point, right?! Granola and fruit, see ya on the flip side. doughnut, which is probably the classy spelling vs donut - the popular way? I bet in canada they spell it doughnut, what with all of our queen and commonwealth business. also, I would be happy to have my native land stake claim on the crazy-good doughnut photography. homemade peppermint patties are AMAZING and super easy to make. i suggest you try it some time. i constantly switch it up. it's one of the few things i'm so indecisive about. Doughnut = fancy. But they aren't fancy. So donut.